Our employees have helped the Auckland Rescue Helicopter Trust to save another life as the result of the Trust winning of the health fund’s Good Cause Grants initiative in New Zealand. In its second year, the Good Cause Grant provides an avenue for nib employees to support the community causes closest to them. The employee nominated and voted grant programme supports five causes across Australia and New Zealand with grants of $5,000. Madison Boon, an nib Statutory Accountant, nominated the Auckland Rescue Helicopter Trust after recognising the important role the service plays in assisting surf lifesaving. “In Auckland, the nearest surf beach is a 45-minute drive along a winding road. When an emergency occurs time is of the essence, so the helicopter is vital to helping surf lifesavers to successfully carry out their role,” Ms Boon said. “I was so happy my colleagues selected the trust as the New Zealand grant recipient as I know they are in desperate need of funds to support their critical service,” Ms Boon said. 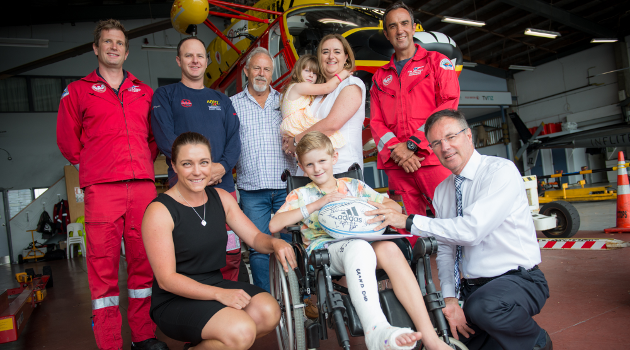 Our Chief Executive Officer, Rob Hennin joined Madison as they met eight year-old Connor Lloyd-Read from Silverdale, who was severely injured in January when the child-sized motorbike he was driving on a farm road in Colville collided head on with an SUV traveling at 40 kph. Connor was wearing all the appropriate safety gear, but was still knocked unconscious and was flown to Starship Hospital in a serious condition. “Each life-saving mission carried out by the Auckland Rescue Helicopter Trust costs around $5,000, so the grant from nib represents another life that we have been able to save in the Auckland region,” CEO of the Auckland Rescue Helicopter Trust, Greg Barrow, said. Mr Hennin said nib was proud to support the causes close to its employees’ hearts. “Many of our people are involved in community work as volunteers, as fundraisers and donors, or because they have benefited from a particular service. That’s why we draw on their collective wisdom to help us find the causes we should support each year,” Mr Hennin said.